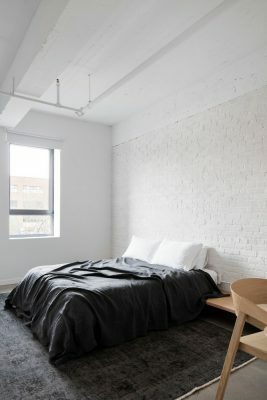 Saint-Laurent Apartment – A cross between a hotel room and loft apartment, the space required a simple yet warm design treatment that would suit its diverse occupants. The architectural firm was given the mandate to redesign this 1150 sq. ft. space, which serves as accommodation for the international clients and collaborators of a company in the fashion industry. 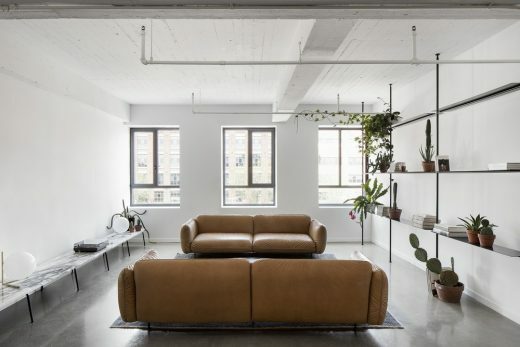 A cross between a hotel room and loft apartment, the space required a simple yet warm design treatment that would suit its diverse occupants. 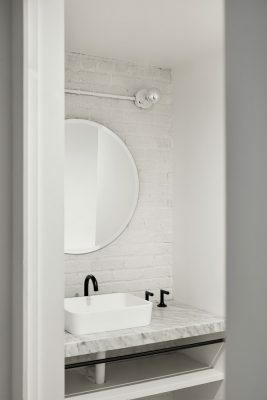 The layout of the apartment was reconfigured to optimize the rooms and allow fluid, discreet circulation between the bedroom, dressing room and bathroom. The freed-up space was used to create a large open living room, bathed in natural light. The original structure was deliberately left visible, the crude quality of the existing frame contrasting with the careful treatment of interior details and materials. The architects chose to treat volumes as bands of colour on a flat plane. 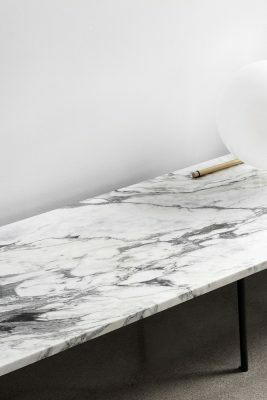 Each surface is designed to draw attention to the materials and textures. 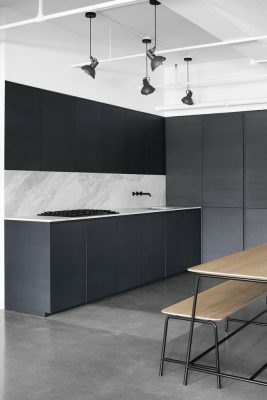 The kitchen, in matte black stained oak, shows subtle variations in shade, depending on the light. 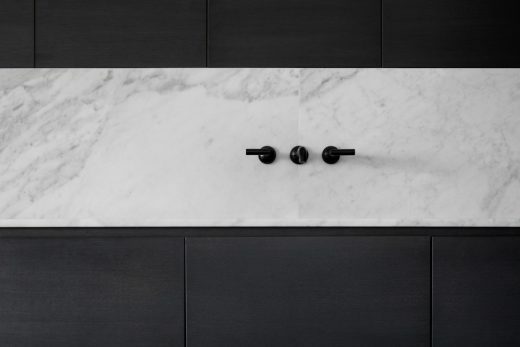 The recessed cabinets are flush with the marble backsplash. 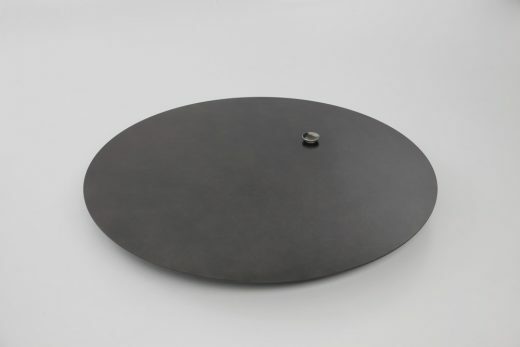 The thicknesses of the materials have been concealed in order to obtain sharp edges where the surfaces meet. 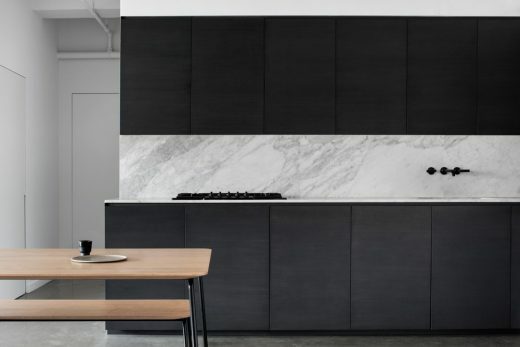 For example, at the angle between the kitchen and adjacent passageway, the marble, stained oak and gypsum appear to have no thickness at all, as if they were horizontal bands of colour in an abstract painting. 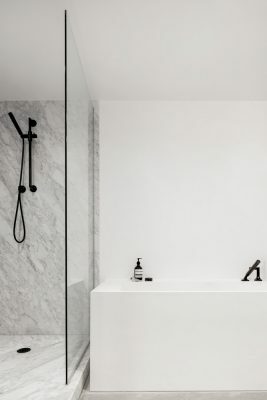 By using juxtaposition and playing with perceptions of volume, the architects have given the space a unique modern art feel. 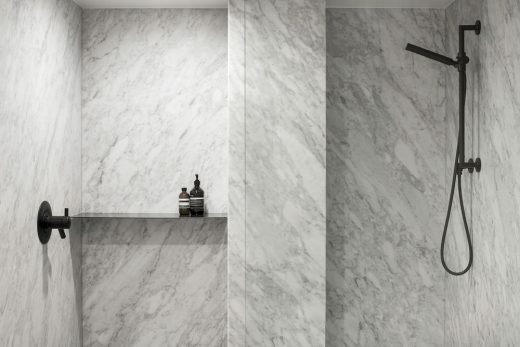 Particular attention was paid to the details to create a consistently sleek design. 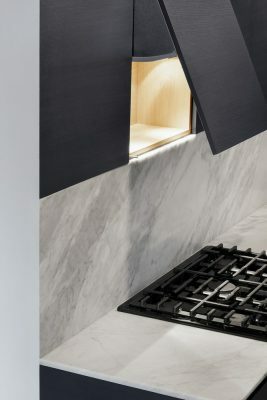 The kitchen appliances are concealed behind co-planar doors with recessed handles. The same handles are used on all the storage units in the apartment. 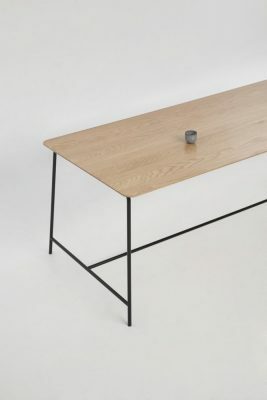 Through their furniture design studio Foraine, the architects also designed all of the free-standing furniture, creating a customized collection that is both functional and refined. 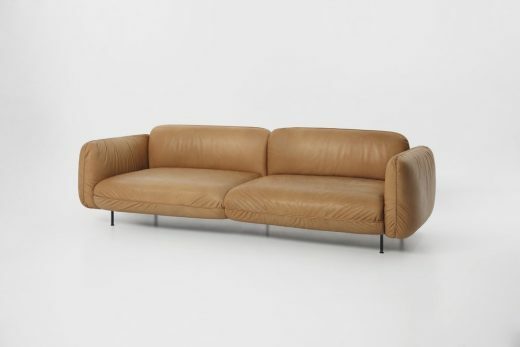 The two ample leather couches and oversize coffee table are the focal point of the living room. 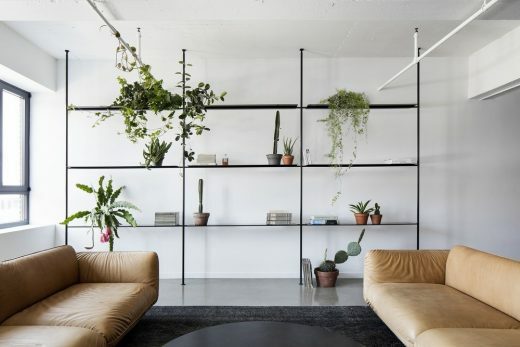 A minimalist metal bookcase and marble bench along the length of the opposite wall add the perfect finishing touch to this room of unexpected treasures. 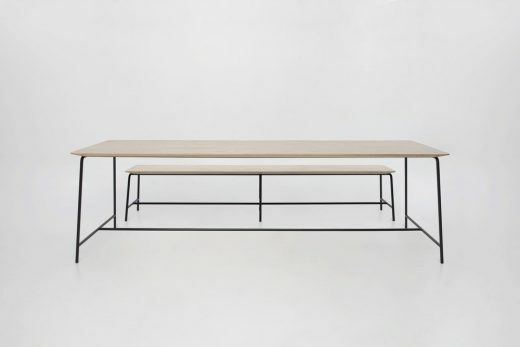 The dining room table and benches, in solid oak with a black metal tubular base, blend with the materials used in the kitchen. The bed frame and desk are also made of solid oak, forming a minimalist, clean-lined set.